Standard E17 base 4W LED bulb, equivalent to 40W halogen bulb, is mostly used for microwave ovens, ovens, ceiling fan light fixture, Christmas lights, etc. 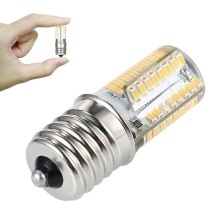 Standard E17 base 4W LED bulb, equivalent to 40W halogen bulb, lower consumption. Designed for over counter microwave ovens, ovens, ceiling fan light fixture, Christmas lights, etc. 400LM output at 6000K color temperature, white light with high brightness. >80Ra high color rendering index, it shows the real color of objects well. Made of silicone, shock and vibration resistant, shatter resistant. 360° beam angle makes sure the light is going to shine from every angle, creating an omni-directional illuminating effect. Note: please don&apos;t install the bulb inside microwave oven.